Understand volume/value sales relationships to pricing. Analyze pricing measure impact on volume and value sales. Is the pricing relationship of the items in my portfolio structured best? Analyze lowest level available: Item level vs. Brand Level, Channel or Retailer level vs. Regional or National level, Monthly data vs. Annual data. Price facts are used to evaluate average retail selling price. Average price can include prices that are similar or prices with a wide variance. 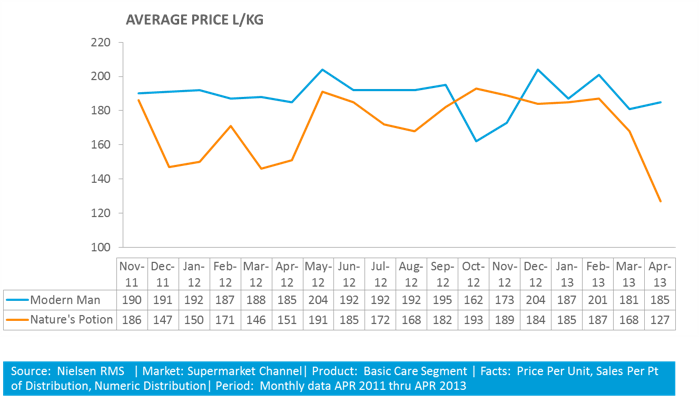 Definition: Price (as reported in Nielsen RMS) is an average weighted price of all stores selling product. Following steps demonstrate how Price is calculated in Retail Index databases. Step 2: Totals are generated. Value and Volume are each summed together across all stores in universe. 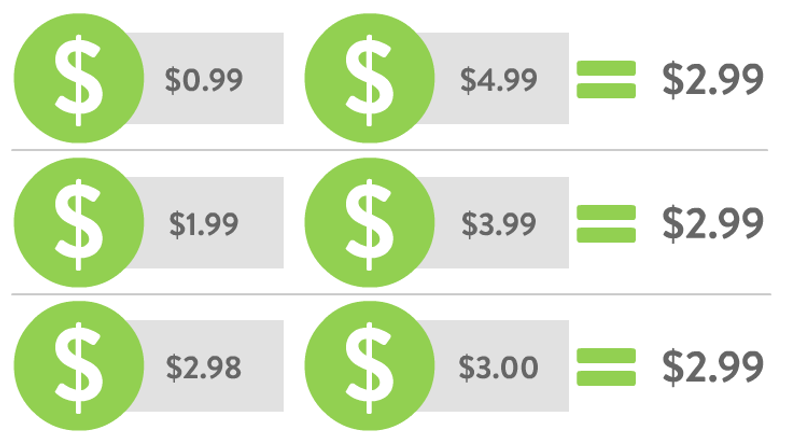 Price Index is ​Your Price as Compared to the Average of the Competitors. What is the Price Index of Modern Man, using the other items as the Competitive set? After several new item introductions in the Men’s Moisturizer category, Modern Modern Man needs to proactively review category and item pricing to evaluate if price changes would help sales of their products. Modern Man must assess how their pricing strategy is impacting sales and if it should be modified to help business. How is Modern Man’s price positioning against competition? How are the respective price segments (tiers) performing? When Modern Man’s price changes how does this impact performance? And when competition’s price changes how does this impact performance? How has the price gap changed over time? In general Modern Man is priced less than competition. The three lower priced tiers posted strong growth while the high-price tier has declined. The lowest priced tier has the largest contribution to sales. How is Modern Man’s price positioning against competition? How are the respective price segments (tiers) performing? 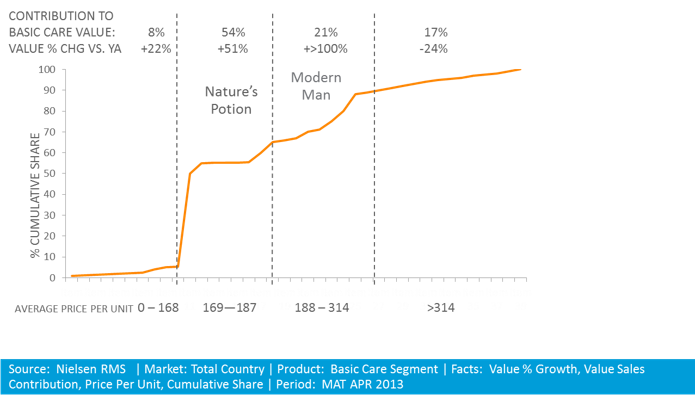 Products priced between 169-187 make up 54% of Basic Care value sales and have increased in sales 51% vs. year ago. The price tier includes Nature's Potion and other items. Select the true statements interpreting data from the chart above. Price, Distribution and Velocity (SPPD or sales per point of distribution can also be called velocity) can be analysed to understand the relationship they have with product performance. These measures answer: When price changes how does this impact performance? When Modern Man’s price changes does this impact performance? Select true/false for each statement. Assessing not only the brand of interest, but competition provides rich details about the cause-effect relationships or price on product performance. This addresses: When Competitions price changes, how does this impact performance? Which period should demonstrate the most concern for Modern Man? A comparison table between competitors provides the ability to assess pricing differences between brands. 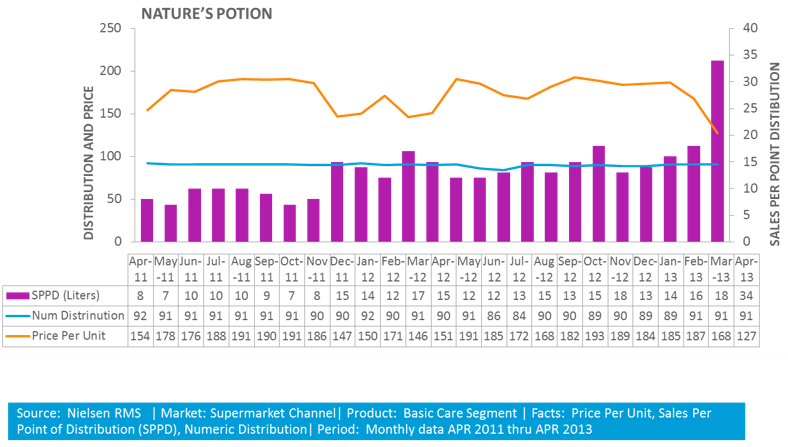 Answers question: How has the price gap changed over time? How has the price gap changed in the latest periods? Modern Man has a premium price compared to the largest competitor, Nature's Potion. In the latest periods the price gap was widening. Modern Man had the most success increasing velocity when having short price decreases.